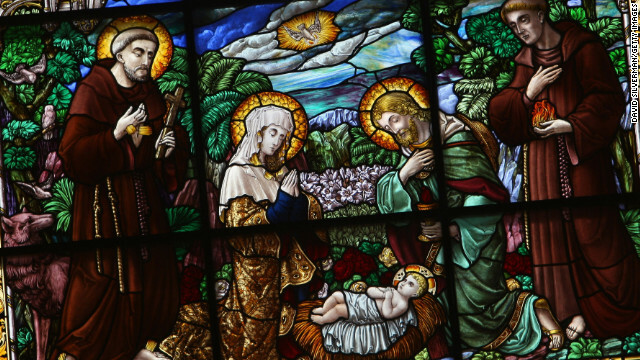 A nativity scene from St. Catherine's Church in Bethlehem in the West Bank. Editor's note: Jay Parini, poet and novelist, is author of the forthcoming book, "Jesus: The Human Face of God." He is the Axinn Professor of English at Middlebury College. (CNN) - At Christmas, the name of Jesus resounds everywhere in homes, churches, in hauntingly gorgeous carols, even casual conversations. Yet Christians didn't settle on December 25 as Christmas day until the fourth century, and this choice probably had something to do with its proximity to the winter solstice or its position as the final day of the Roman Saturnalia. It was in the late third century, in fact, that the Roman emperor Aurelian established this date as a feast day celebrating the birth of the Unconquered Sun (Sol Invictus), so it already had festive and quasi-religious prominence. Now it serves to welcome the infant who became Christ, the Greek word for Messiah. There are probably as many visions of Jesus, and versions, as there are Christians. Many regard him as their savior, the Son of God sent to Earth to save human beings from themselves. Others see him as a great teacher, a healer or rabbi of extraordinary power, a holy man or prophet who proposed a new covenant between heaven and earth. To some, he represents a new world order, an egalitarian society, a preacher of nonviolence who asked us to turn the other cheek. the last two times there were 4 consecutive blood moons in the gregorian c alendar was 1948, and 1967. israel reinstated itself in 48, and 6 days war in 67. the next time that happens is 2014-15 blood moon is associated with Christs' return. 26 “When the Advocate comes, whom I will send to you from the Father—the Spirit of truth who goes out from the Father—he will testify about me. 27 And you also must testify, for you have been with me from the beginning. Truth? What truth....it's a bunch of fairy tales made up by uneducated men in tents who thought the earth was flat and at the center of everything and otherwise had NO concept of what science was, and as a result had to resort to story-telling. Seriously...go read some science books...and seek psychological help if that doesn't help. Ever notice that there are 2 Christmas stories (Luke and Mathew) that are totally inconsistent? They can't both be true. So there is at least one major story of the bible that is obviously not true. How can the bible be inerrant? There are 2 creation stories that are incompatible with each other. read Genesis. How can the Bible (or Torah) be inerrant? Here's some basic comparative religion. Here is a great question for those who appreciate seeking and finding truth. disease spreading lunatic under the Law. This should make sense to you right? Now if a planet run by crazed leadership has plans to conquer our Milky Way Galaxy by going viral and subduing all species in the child stage of their life cycle (low technology) and control as much life as it can through the used of disease, then an act of love for the Milky Way would be to remove the virus, disease spreading species under the Law? * Note that there are many laws which govern the Milky Way. Now if Humanity is the species, should Humanity be removed? Sounds more like an argument to eliminate belief in the supernatural. . . I would suggest you try and research beyond crackpot websites that tell you what you want to hear. Horus is a copy-cat. Cheap imitation conceived of by Satan. Horus came long before Jesus, so he can't be a "copy". Red? Uh, what planet do you live on? "(Some say he was a mamzer.)" Some say you are an idiot. Guess if "some" say it, it must be true. "In [Rabbi Jesus: An Intimate Biography] (2000), Professor Chilton develops the idea of Jesus as a mamzer; someone whose irregular birth circu-mstances result in their exclusion from full participation in the life of the community. He argues for the natural pa-ternity of Joseph and finds no need for a miraculous conception. In his subsequent reconstruction of Jesus' life, Chilton suggests that this sustained personal experience of exclusion played a major role in Jesus' self-ident-ity, his concept of God and his spiritual quest. "In [Historical Jesus] (p. 371) Crossan treats this cluster, like 007 Of Davids Lineage, as an example of the interplay of prophecy and history in the development of the Jesus traditions. I do not accept the divine conception of either Jesus or Augustus as factual history, but I believe that God is incarnate in the Jewish peasant poverty of Jesus and not in the Roman imperial power of Augustus. " Birth of Apollonius (Philostratus, Life of Apollonius, I.4) [see Acts of Jesus, p. 505]"
Many people have tried earnestly for many years to get rid of Jesus. Guess what? It ain't gonna happen. You can spin it and deny it and pretend it doesn't exist; but, the truth is the truth. Don't worry education will eventually kill Jesus insanity. When in doubt, Reality goes back to his appeal to authority fallacy. @Anon- I think you are mistaken. Moreso, there is no evidence that education eliminates religion or faith. When you read the red words Jesus says a whole lot against divorce and being rich, and for helping the poor, but nothing about gays, or abortion. Seems that the "Red States" don't follow the red letter printing in the Bible. Funny, that. Reality must be starting out ar "A" again on his list of copy/paste drivel. That they shall rise again." So where are the bones"? As per Professor Crossan's analyses in his many books, the body of Jesus would have ended up in the mass graves of the crucified, eaten by wild dogs, covered with lime in a shallow grave, or under a pile of stones. "..., But with Jesus I get a little heaven on earth..."
I love that in this day and age despite every reason not to people still gather and greet each other in the name of Jesus and pray and sing our hearts to God. It is great that today in spite of all our differences people still meet and greet each other in the name of the Prophet (PBUH) to pray and sing our hearts to Allah. supersti tion, because people use to think that evil spirits came out of the nose. So, despite our advanced knowledge, we are still generally as supersti tious as people were a thousand years ago, and belief in Jesus being seen as lucky is just another part of that.